School teacher and rationalist, Hal Clement, most famous for Mission of Gravity, is one of the fathers of hard science fiction. His works deal in real science, and a theme that kept coming up in this collection is characters who face issues that would realistically come up in SFnal situations, be them dealing with aliens, unexpected gravity, or even mechanical problems. It was very satisfying for me to read about characters whose first impulse isn’t to shoot first and ask questions later, but to ask question first, to observe, to learn about their surroundings, to make the best possible decisions with the resources at hand. And the alien descriptions are just amazing. How would creatures evolve on different types of planets with different environments and resources? What would they think of humans? Those are the types of questions Clement thought about. Enjoyable and completely readable, these are recommended to all fans of hard science fiction. These stories may be slower paced, but they’ve got pay-offs that beat many fast paced space opera adventure stories. 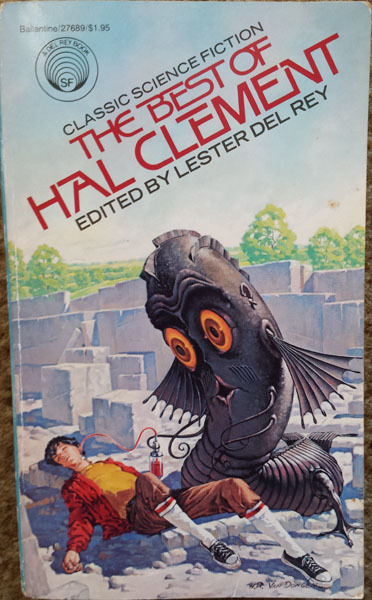 Lester Del Rey edited and wrote the introduction to The Best of Hal Clement, and convinced the “I’m not a writer, I’m a teacher” Mr. Clement to write the Author’s Afterword. The collection includes: Impediment (1942), Technical Error (1943), Uncommon Sense (1945), Assumption Unjustified (1946), Answer (1947), Dust Rag(1956), Bulge(1968), Mistaken for Granted (1974), A Question of Guilt (1976), and Stuck with It (1976). Impediment – Aliens have landed in a remote area of North America, hoping to find a particular element with which to recharge their weaponry. But first, they must face the challenge of first contact with human beings. These aliens have no vocal speech, and use a completely different method of communication than we do. At first they are not sure if we are even intelligent. They do make contact with a lone hiker, and are able to communicate with him through writing. Impediment offers some excellent discussion on communication and language. And it was nice to see a First Contact story from the aliens point of view. It’s obvious to the reader what their human friend is doing and saying, but the aliens have no idea.